Once the company has made the decision to relocate, appoint a move manager – an employee (or committee) to act as a liaison between the company and outside vendors who will be involved with the relocation. The move manager should also be the person responsible for communicating with employees and management to ensure everyone is informed and on-board with the arrangements. This person should be detail-oriented, well organized, and a good communicator. Determining whether furniture and equipment will be moved to the new location, put in storage, or sold. Finding out from your insurance broker about the extent of your coverage for furniture and equipment. Making certain that all services like telephone, IT, construction, painting, and carpeting are completed before the move in. Keeping employees informed and prepared. Start preparing well in advance – sort out what is moving and what is not, pack as much as possible as early as possible. 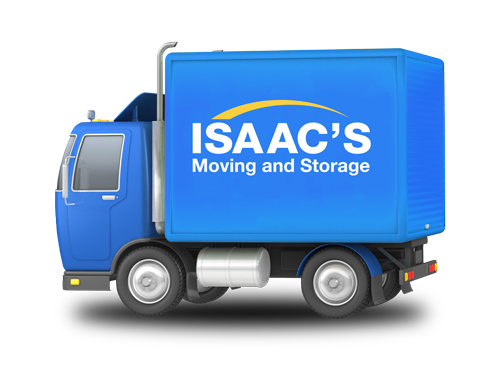 Isaac’s can offer comprehensive packing as part of a commercial move. If you decide to do some or all of the packing yourself, we can provide you with the specialized packing materials. Everything needs to be packed before the moving trucks show up – ideally, there should be no employees around still finishing off some last minute work or packing their office at the last minute. Pack all desk materials (inside and on top) in boxes. Put loose paperclips, pencils, and other miscellaneous items into envelopes, seal them, and pack them in a box. Remove printer/copier ink cartridge and removable media from computers. Make sure you designate owners for all public areas and common work areas like labs, conference rooms, reception areas, cafeterias, etc. That way, all the spaces will be packed when the movers show up. For commercial moves, we use a simple, yet efficient system to eliminate mass chaos during the move. Our coding system labels each room and article so that the crew can put everything in its proper place. Employees should have access to the new site map and their own office location so they can properly label their belongings to go to the right space. Color-coded tags for each piece of furniture and box indicating region. Typically we would use a color per floor but they could also indicate different office area, labs, work areas, etc. Everything must have a tag or must be inside something with a tag! Remember to tag the trash can, floor mat, phone, white board, chair, everything in your office/cube you want to go with you. Tags must be easily visible so that the movers can quickly identify and direct articles to their new location. Isaac’s advises against placing tags on fine furniture with polished surfaces. In this or other special cases, ask your move coordinator to help recommend how to label these items. We also recommend removing tags immediately after the move so they don’t leave long term marks on the furniture. When planning a move, it is best to have a detailed schedule to follow. This will help keep you organized throughout the process and help ensure a smooth move. The following master schedule should give you a clear overview of each aspect of the move. Furniture status for new office: Begin contacting furniture companies and surveying your needs for new furniture if applicable. Telephones & IT: Begin discussing what phone and internet services are available at the new location. Evaluate the existing services and determine if and how they should be modified to better suit your needs after the move. Address Change and Business Forms: This is the time to organize your existing business documentation and plan the address change. You will want to make a list in order of priority. This list should be used to determine which documents are most important and which documents/forms will need to be changed prior to the move. Coordinate with your marketing and business teams and discuss everything – even business cards. Does the new building need new signage? Construction: Verify any building or structural changes for the new location. Meet with key people to determine what the needs will be in the new area and if any addition construction will be necessary. Office equipment & Computers: Evaluate current and future computer and equipment needs. Contact companies that will be able to address these issues and begin to price out computer systems and other equipment that will be required. Movers: Begin to schedule appointments with movers to estimate your move cost. Telephones & IT: Finalize proposals from suppliers and IT partners you have been considering for new service. Address Change: Review the plans for updating documentation, web sites, customer notifications and make sure the plan covers all the relevant parties internally and externally. Furniture: Decide on which company will be supplying your new furniture. Once the vendor is selected you should have the dealer take any necessary measurements and place your order. Movers: Pick a mover (hopefully Isaac’s Moving and Storage!) Review your estimates and decide on a moving company. Once you have selected a mover contact them to arrange the date and time of your move. Telephones & IT: By now you should have signed agreements and your IT team should be testing the plan and making sure all the pre and post move activities are in place. Most important – make sure you have a contingency plan should something go wrong to ensure your business operations are not affected. Address Change: First notices to key partners and vendors should be going out already. Your marketing person should be managing a day by day plan of activities as the move gets closer. Movers: Contact the building managers of both buildings to reserve elevators if necessary. You should also arrange for any necessary parking permits where applicable. Packing instructions: Send instructions and labels to employees so they can start thinking about packing and preparing for the move. Certain areas or equipment may be designated for early packing and can be packed and labeled now to reduce pre-move stress. Movers: Deliver and distribute modular packing boxes and packing materials across the site. Hold lunchtime demonstration on “how to pack your office”. PACK!!!! All employees (including the CEO) need to pack their belongings into the specialmoving crates before the move. Usually this all happens the day before, but you can start early with items you don’t need before the move and make sure employees who may be out on vacation or business travel pack before they leave. Address Change: Pull the trigger and let everyone know you’re moving. Forward mail at the post office, advise UPS and Fedex, let the person who maintains your plants know. Update the website, distribute new business cards and get all your employees to add a special note about the move to their email signature. New Office: Make sure you have the keys, employees get access cards and parking instructions – make sure they will feel at home when they arrive. Only the Move Manager and a team of coordinators should be around – everyone else should enjoy a day off while Isaac’s Moving and Storage work hard to get you to the new location in time.